. : Pre-Olympic Groomer's Report #2 :: Ski XCOttawa.ca :: Skiing in Ottawa and Gatineau Park :. Four days into their grooming , lists are getting longer and more specific. The Russian TD (FIS Technical Delegate) and the German TD have arrived – both pointing out important details. The snow is too soft on the outskirts of the course as ski poles sink in, so Dirk has organized the biggest of the grooming machines -the Pisten Bully 600 to slowly groom and compress the snow this morning. Then the inside corners are wearing thin and dirt is starting to show through. Even hand shoveling yesterday wasn’t enough to counter act the quickly melting snow in this dense fog, drizzling condition. The machines are scheduled to move big amounts of snow into these areas today to stay in line with the all-white-snow-covered mandate. And finally the stadium is in constant work mode – it has to be perfectly level right across for fair play. Groomers from across the country are working with Dirk; Simon formerly head groomer at Hardwood Hills, Peter Crooks (Sean’s uncle) who’s fulltime business is grooming the three T-Bay ski areas, Rob Lafleur who’s company raised the standard in the Gatineau Park, Bill and Jodi both from Sovereign Lakes have World Cup experience, Brent a local alpine groomer, and Sorin from Sun Valley, Idaho. The excitement rises as the Teams arrive. Japan, Spain, Germany and Russia were out skiing yesterday. A thrill for me was to watch the Russian men’s sprint team do a time trial on the official race course. Standing on the edge of the stadium, you never loose sight of the skiers the entire course – running with their diagonal strides at an incredible pace off the start line, then transferring into the new double-pole jump technique right across the stadium and a third up the the big incline, changing to a very choppy diagonal stride before extending into a beautiful rhythm over the top and back into the double pole. Tucking down the hill, around the corner, half of the skiers jump double-poled around the stadium to the finish line, with the others choosing to diagonal-stride the final metres. But, I found it interesting to see all five skiers use grip wax for this Olympic sprint course trial – it will be interesting to watch at Friday’s World Cup Sprint competition – to see if the big uphill is steep enough to ensure waxed skis, or will some athletes use skate skis for faster glide and the jump double-pole technique around the whole course. It was discussed to steepen the uphill after last years Nationals, but in the end the big hill was left alone. I’m off to the Nordic Centre to get my ski in for today, and hopefully connect with Dirk who has only been on skis twice now – testing the “fast line” from a groomers perspective. Yesterday I skate skied (cause I’m too lazy to put Klister on my classic skis at these warm temperatures) up the 15km loop of Medeley Trail and around the new Norwegian Way that climbs into the high alpine through cathedral forests. Immaculate grooming wide enough for both classic and skate skiing, this stunning new addition retains the intimate backcountry feeling as you pass over streams, see frozen waterfalls, and giant mushroom capped tree stumps laden with snow. Yes, a cross country ski paradise. 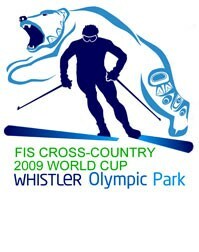 2009 Cross Country Skiing World Cup website: http://nordiccombined-vancouver.com/crosscountry/ccworldcup/tabid/395/language/en-CA/Default.aspx. Ski Gear: Gerry & Isobel's Annual XC Ski and Snowshoe Spring SALE!